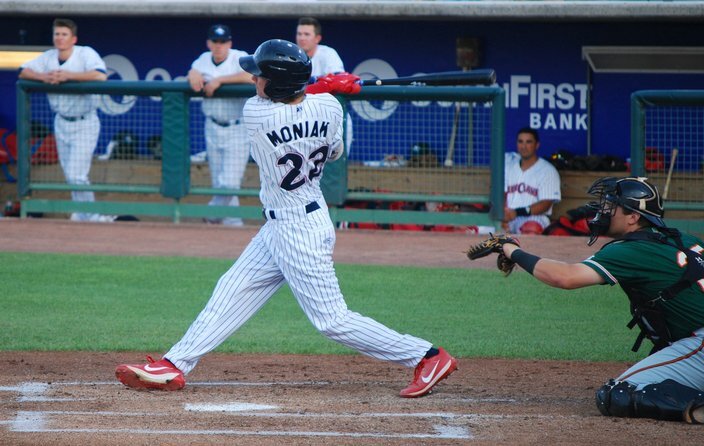 Mickey Moniak entered Monday hitting .273 with a .322 OBP in 73 games at Low-A Lakewood this season. He has 15 extra-base hits in his last 38 games. LAKEWOOD, N.J. – The kid from Southern California is a millionaire now, thanks to the signing bonus as a former No.1 overall pick, he has the athleticism scouts dream about in center field prospects, a smooth left-handed swing, and a baseball name we’re sorry we’ll never hear the late, great Harry Kalas say aloud during a future broadcast. Mickey Moniak is still less than 14 months removed from his 18th birthday, though. He’s been playing professional baseball for a year and a week, but remains an extremely young prospect with a lot of minor league baseball to play before he jumps onto the Phillies radar. Still, the flashes of brilliance are exciting. And Moniak shows glimpses with his quick stroke in the batter’s box, his route running in the outfield, his natural motor around the bases. The future is coming. The Phillies’ rebuild perhaps isn’t as fast as many fans would like, but Nick Williams has entrenched himself into an ever-changing lineup in the last week and, before season’s end and into Opening Day 2018, more prospects will follow suit. 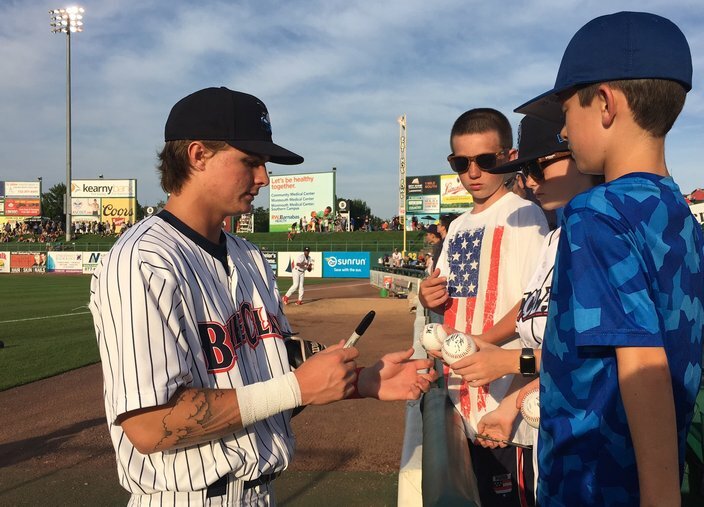 Mickey Moniak, who turned 19 in May, signs autographs before a recent game at FirstEnergy Park in Lakewood, N.J. If the Phils’ plans prosper, Moniak will be a part of a second wave of elite prospects currently in A-ball to make their way to Philadelphia within the next half decade. He has talented teammates like fireballing right-hander Sixto Sanchez and toolsy second baseman Daniel Brito at Low-A Lakewood, and he has others behind him at short-season Williamsport, like former 2016 draft pick and former Team USA teammate Cole Stobbe and 2017 first-round pick Adam Haseley. Trying to pinpoint the major league arrival time of a group of teenagers is a risky proposition. But fans eager to see the future can take a day trip to Lakewood, N.J., or Williamsport to get a sneak preview this summer. 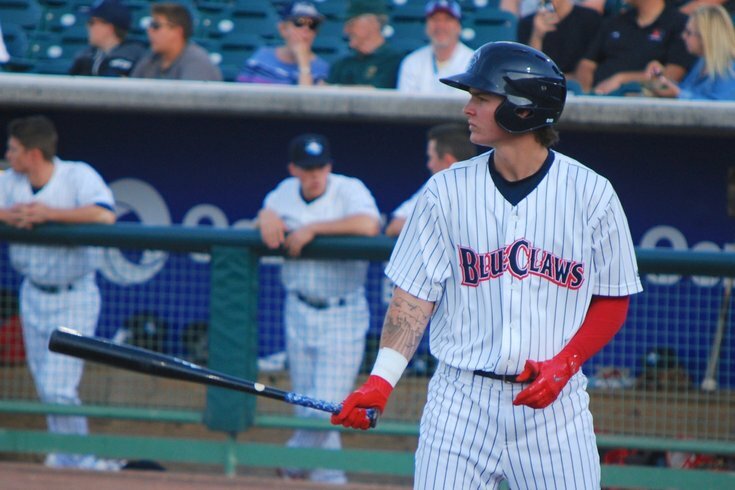 Moniak, the No.1 prospect in the Phillies system in our most recent Prospect Power Rankings, sat down with PhillyVoice for The Q&A before a recent Lakewood BlueClaws game to talk about life one year removed from being the No.1 overall pick in the MLB Draft. You’ve been here in the Phillies organization for a year now. Is there any one person who has been the most influential, that you’ve learned from, or who have been helpful? Moniak: Definitely J.P. (Crawford). Me and him are really good friends, we hung out in the offseason, being Southern California guys, we have the same agent, all spring training we hung out, pretty much every day for the most part. He’s been awesome. How does that work in the offseason, when you’re in different spots with jobs to do, stay in touch through texting? Yeah, yeah, we’ll text back and forth just to say what’s up, stuff like that. Lehigh’s not too far. But we’ll definitely see each other in the offseason for sure. What do you think you’ve learned most about yourself in the last year? Honestly, the big thing for me is what it takes to keep me healthy. I think that’s been a big thing. In high school, you play there games a week. You show up an hour before the game, stretch, and go play. Now you have to show up six hours before, BP, infield, and outfield. So it’s definitely been taking care of my body. In terms of putting on weight, staying strong for the duration of a 5-6 month season? Yeah putting on weight, keeping it on. Just staying healthy in general, stretching, tissue prep, all of that kind of stuff. Mickey Moniak was the first overall selection in 2016 MLB Draft. Being a No.1 pick obviously comes with a lot of perks. When you signed your bonus did you make any fun purchases, buy a car or something like that? Yeah, I bought my car. I got a Maserati. It’s out there (parking lot). On Twitter I got a lot of crap for it. But it was fun, a good time. Yeah, you put in the hard work to be a first-round pick, deserve to get something fun. Do you know anything abut Adam Haseley? No, I’ve just heard he’s a stud. So I’m excited to get to know him, probably during instructs, who knows where he’s going to end up in-season [Haseley was promoted to short-season Williamsport on Thursday] or when I get the chance to meet him, but it’s exciting. Do you keep up with fellow Phillies prospects during the season, like the guys you were drafted with and played with before you were in pro ball? Absolutely. When we’re in spring training, last year in the GCL, in instructs, it’s a good group to hang out with. I keep in contact with Cornelius (Randolph), he’s one of my good friends. The entire system stays close, real close, so it’s a fun organization to be with right now. Where do you expect to see yourself in three years? You’ll be what, 22 by then? I guess. That’s my goal. Look at a guy like (Scott) Kingery, drafted out of college two years ago and now on the cusp. And you can look at a guy like that and see power doesn’t always develop overnight. It just happens. Exactly. I know that. Speaking of that, some guys are power guys, some are speed guys, some are known for their defense. How would you describe yourself? I’d say all-around, a little bit of everything. I obviously love to hit. Defense is definitely one of my strong suits, being able to run is one of my strong suits. So, all-around. I don’t think there really is one thing. If I had to pick on it’d probably be hitting, spraying line drives all over the field. Any big leaguer you look out and say, ‘that’s the model?’ I guess (Mike) Trout feels obvious. Well obviously everyone wants to be Mike Trout. But the comparisons most people have used for me is Christian Yelich, Jacoby Ellsbury, guys like that. Who’s the most popular alum from La Costa Canyon High School? Ooooh, that’s tough. I’d say right now Kenny Stills. At the moment, Kenny Stills. Yeah, coming off nine touchdowns last season in the NFL, that’s pretty good. There’s an actress, Haley Webb. Do you know what that is? From the TV show Teen Wolf. Yeah, I just saw that today. Also the former bassist from the band Foster the People (Cubbie Fink). Ok, who is the best baseball player to come out of the San Diego area? I’ll include guys who played in college in San Diego. But Tony Gwynn’s a Hall of Famer, so he doesn’t count. Well, you’ve got Ted Williams. Ah, right. Let’s just get rid of the Hall of Famers for now, since they’re on their own level. Some of the younger guys, Bradley Zimmer, (Brady) Aiken. Aiken (another former No.1 overall pick) is playing somewhere still, right? Yeah, I think he’s in High A with the Indians. He’s coming back from Tommy John. Yeah, he went to USD. So there’s a lot of good guys. A nice fraternity to be a part of. There’s a lot of guys. It’s weird when you go back in the offseason, they’re just all around, so it’s fun. Yeah, my dog. Obviously friends and family. There’s a lot. And I’m always going to go back there in the offseason to hang out. What do you have, a lab? Yeah, a black lab. He’s a year and a half. Oh, he’s just a puppy. What’s his name? That’s great. Is he your dog or the family dog? I pretty much took care of it the entire offseason and all of that, hanging out, taking it on walks. But when I’m gone it stays (with my parents). Get him before high school graduation? We got him on Valentine’s Day, senior year of high school. Yeah, I had a chocolate lab for 16 years, she passed two years ago. Now I have a mutt who’s an athlete, he catches fly balls like it’s his job. Yeah, when you live the baseball life it’s tough with a dog because you’re traveling all the time. Yeah, I’d love to bring him out here but it’s just not going to work out. Two brothers and a sister. I’m the oldest. Did I see your one brother has a music career? (Collin Moniak) is 17 now. I stumbled on that, he’s into hip hop? How would you describe his sound? J-Easy, like a J-Easy type of guy. He’s good, man. It’s impressive. Any other siblings into sports? My youngest brother (Jake) plays baseball, but he’s a skater, he skates. And my little sister (Jordan) is a cheerleader and gymnastics. She’s the youngest. Do you still talk baseball with your grandfather regularly? Yeah, he’ll text me after the game. Because he’ll listen to every game on the radio, so he’ll call me, ask how my at-bats went, give me tips, things like that. What walk-up song are you using right now? 'Red Bone' by Childish Gambino. Yeah, I noticed that two months ago. So you’ve had it all year? What goes into picking a good walk-up song? Favorite thing right now on Netflix? Oh, yeah my brother was into that. Big into that. I’m on Season 6 right now. I think there are 7. I think they’re all on Netflix now. No, a lot of guys on the team but not me. It’s a lot to undertake, 60 episodes. Oh, that’s a good one and it answers my next question, what’s your favorite baseball movie. So what’s your favorite non-baseball movie? Non-baseball movie? Good Will Hunting. Right. I mean you gotta love Mike Trout, Bryce Harper. (Cody) Bellinger is incredible. Last one: favorite current teammate? It's just that good of a clubhouse? Yeah, we’ve got great guys, there are no issues, we have fun, mess around, stuff like that. Mickey Moniak entered Monday hitting .293 with a home run and two doubles in his last 10 games.